For many, sitting on a mountaintop at sunset, to gaze at the layered mountain views in every direction brushed in a kaleidoscope of color, is pure bliss. A moment when watching the eagles dance in the sky above the forest and listening to the whispering wind is all one can think about. And then dusk turns into dark, now twinkling lights far off in the distance compete for one’s attention against the millions of stars in the sky. ‘Heavenly’ is how folks describe living in the mountains of Western North Carolina. The fresh air and quietness invokes a satisfying sense of wellbeing. In fact, science has proven nature makes people happy. When Real Estate Scorecard finds places like this, NC mountain communities who have preserved the natural setting yet have tastefully built lifestyle amenities people desire, they tune in. The Coves Mountain River Club is one of those places, a gated mountain community they've watched unfold since 2006. Mountains and a scenic river. A rare combination to find in Western North Carolina. Spread across 3,600 acres, its topography is quite diverse. From elegant homes perched up on a mountain top, to cozy cabins built on gentle sloping land, or riverfront property or larger private estates with over 10 aces, there’s something for everyone at The Coves. Most folks searching for the best places to live in North Carolina move away from the north to escape the harsh winters. This makes the community’s elevation an important attribute. Unlike the High Country (Blowing Rock, Boone & Banner Elk), The Coves experiences four distinct seasons yet rarely does snow stick around for more than a day, when it happens. It is also located in one of the most affordable mountain towns, the town of Lenoir. Riverside at The Coves is a neighborhood that parallels five miles of frontage on the Johns River, a mountain-fed stream flowing down from Grandfather Mountain. Here the community’s full service equestrian center, paddocks and training arena hug the banks of the river. Isabel’s Garden and Evelyn’s Vineyard are two community gardens adjacent to Round Mountain Ranch as well as The Coves River Pavilion and Penelope Cascading Falls. 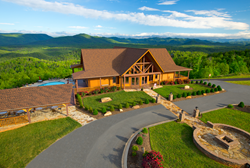 Of the 49 NC mountain communities Real Estate Scorecard has seen, The Coves Mountain River Club is one of the few mountain communities with natural water amenities. Residents enjoy trout fishing, tubing and lazy summer days splashing at the crystal clear Johns River. With four private cascading waterfalls and 39+ miles of walking and hiking trails that begin in this area, what a place to live with a four-legged pooch or horse. Something else Real Estate Scorecard finds significant about The Coves is that Wilson Creek, one of North Carolina’s top trout fishing streams, connects to the Johns River and is less than 10 minutes from a Coves entrance. Wilson Creek is a 49,000 acre designated natural wildness with miles of hiking trails, waterfalls and kayaking rapids. Elevations rise up to 1,700 feet where the community’s 6,000 square lodge is seated on the mountain summit. A conscious steward of the land, the developer saved this land parcel for everyones enjoyment. Here the timber clubhouse has an outdoor infinity-view swimming pool and hot tub on the mountain’s edge. It’s divine. The lodge is appointed with a fitness center with windows facing the mountains, a billiard room, library and great room with a gorgeous kitchen/bar, fireplace and more entertainment space. The floor to ceiling windows and wrap around outdoor veranda showcase stunning views of Table Rock, Adams Knob, Brown Mountain and the South Mountains range. The lodge is busy all the time with social club events including guest lectures, artist in residence presentations, cooking demonstrations and themed cook-off competitions five times a year. At the community’s main entrance, is the attractive stone guardhouse and accent lake with a spraying fountain next to Highland Falls, one of four waterfalls at The Coves. In the Round Mountain Ridge neighborhood, residents enjoy walkable mountain property. Why is this important? Many of the people Real Estate Scorecard talks with desire to live in the mountains but want elevations that aren’t so steep so they can walk around the neighborhood. Gentle slopping land also means less site preparation saving money during the home building process. At Round Mountain Ridge, when it’s time to retreat up to the lodge at sunset, residents grab their ATV or golf cart. The pet friendly community is also golf cart friendly. The Coves Mountain River Club has both; walkable mountain land and steeper mountain homesites for those who want to capture the maximum layered mountain views. Folks also have the choice of living along or near the Johns River or owning larger land parcels over 10 acres. We noticed prices are very attractive as well. Larger land parcels in the High Country Farms neighborhood begin around $5,000 per acre or spacious homesites with distant views average in the low $80’s. Coming soon, The Coves Mountain River Club plans on introducing low maintenance cottages this spring near Pisgah Mountain Lodge priced in the $300’s. From what Real Estate Scorecard has seen in mountain communities, no community offers the diversity that folks will find at The Coves. Still early in development (approximately 75 homes built to date), buyers have an opportunity to find a variety of land types or watch for a resale home. Fortunately, all the amenities are already built for the property owners enjoyment today. HOA fees are around a $1,000 a year. One property owner cites “total satisfaction with: location/views, amenities, affordable dues, great neighbors, many social opportunities, mountain lodge clubhouse, community safety i.e. Firewise Certified, gated community, landscaping.” Property owners have scored The Coves a whopping 92 out of 100 which includes scores about its location. The Coves is set in a perfect triangle, built between three of the most affordable mountain towns; the town of Morganton, Hickory and Blowing Rock. The towns are very unique and fun. They all have tasty cuisine, unique boutiques and mountain festivals. As these towns continue to attract boomers, businesses like Publix are digging in their roots. The town of Lenoir, where The Coves is located is known for the annual Blackberry Festival, the monthly muscle car Cruise-Ins and it’s Sculpture Art Trail, the largest in the country. Real Estate Scorecard salutes and honors The Coves Mountain River Club with their 2017 Bliss Award for Best Mountain Community of the Year. Folks exploring mountain communities, should ask for The Coves complimentary 84 page Western North Carolina Visitor’s Guide. Call 828.754.0700 or write info(at)thecovesnc(dot)com.